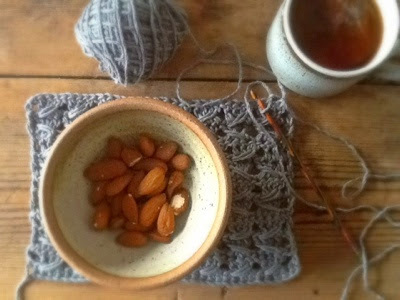 I love texture and I love a challenge, so I tried a new stitch. 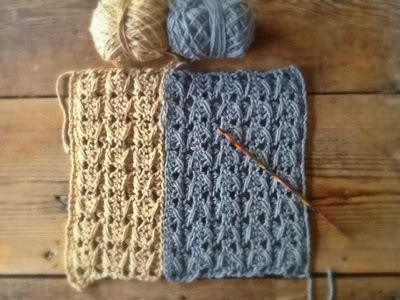 Crochet cable stitch. 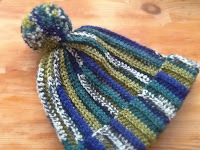 I previously thought that cables and crochet in the same sentence involved front and back post trebles. Clearly I was wrong. These are simply extended trebles worked round three trebles. I'm sure there are variations. I haven't tried any yet. 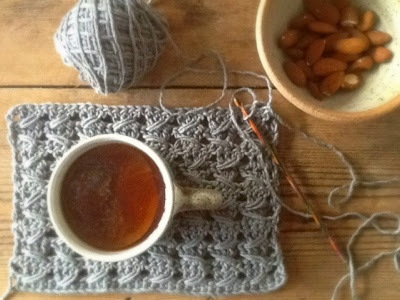 Is there anything more therapeutic than a good cup of tea with a spot of crochet? I doubt it. It didn't even matter that I tried a couple of other textured stitches and ripped them back before getting the hang of this one. 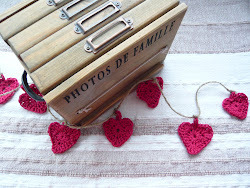 That's the beauty of crochet. If it doesn't work, frog it. Nothing wasted, except a little time. 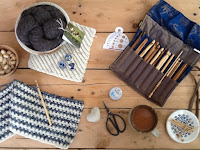 I might back these little samples with a piece of an old felted blanket. Make them into a proper placemat. 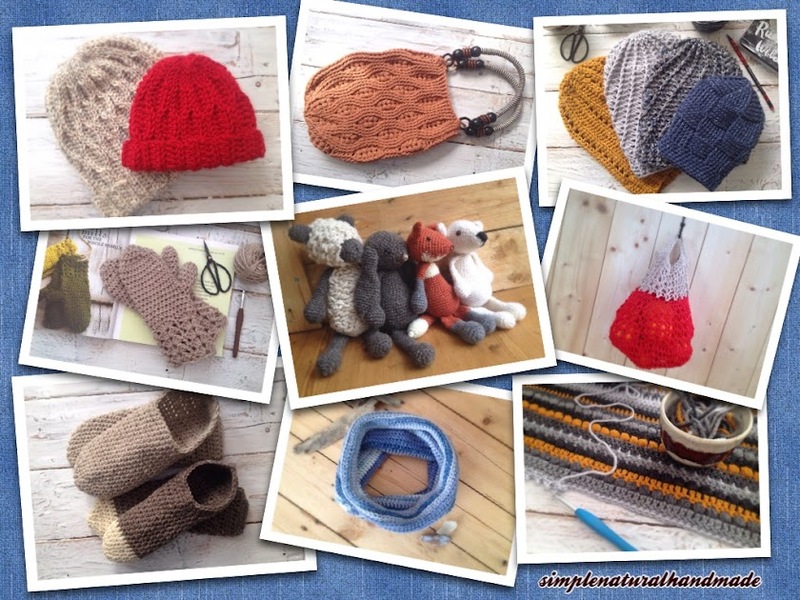 Why look at something manufactured when you can look at something handmade? We've been keeping things simple here this month. I cleaned out our fridge and freezer and took the opportunity to talk M into meal planning and 'keeping it simple'. He's a shocker for filling the freezer with things we never eat and for dodging anything that looks like a salad ingredient in the fridge. Tonight I persuaded him to make spaghetti bolognese and throw in some peppers, courgette and celery, and use up the Quorn mince from the freezer. There was moaning but he obliged and the kids didn't notice that it was Quorn or that it had added stuff. Had they known they would not have approved of celery or courgette. Armed with our meal plan of simple meals, the weekly food shop was also much simpler and we spent less. I'm pretty sure we will waste less too. We've cut out so much sugar from our diets this last month. M has diabetes and it got quite out of control just before Christmas. It was a wake up call to pay attention to food labels and treats. We're all joining him in this more sensible approach to sugar and it hasn't been a problem, even for Haribo addict Jake. Luckily J is also very fond of fruit and any kind of cereal bar (though it was a challenge to find a healthy brand with low sugar). M and I are eating more nuts. J is eating more fruit. E has discovered she likes green tea. Her favourite snack is bread sticks and humus. Moods have been a little more level which makes me wonder... maybe all the hype about sugar is true. 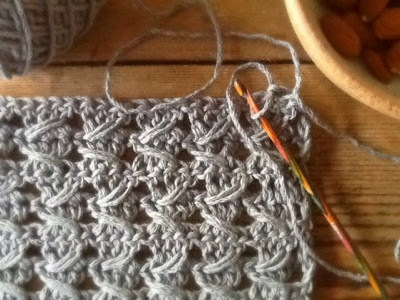 I really love that stitch, it looks really pretty. 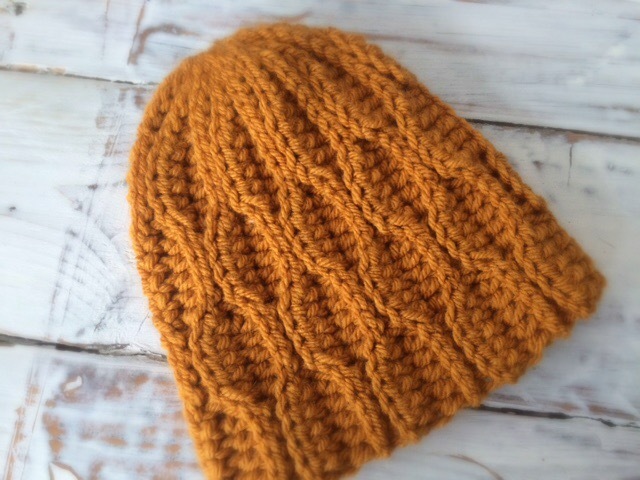 Love the cable stitch. It gives a great texture. We've been meal planning and it's a lot easier to shop to a budget.